While we talk a lot about skin, even healthy, young-looking skin won't disguise your true age if your hair is a dead give-away. Thinning hair and even baldness often seem like inevitable parts of aging. But they don't have to be. You can keep your hair as full, shiny, and youthful as your skin. A simple molecule might be just what you need. I've told you in the past about nitric oxide. It is a signaling molecule. It contributes to circulation, which is key in keeping your hair and skin looking young. Since the skin is the body's largest organ, it's essential that blood be able to reach it easily. Nitric oxide helps your arteries relax, which improves circulation. And good circulation means that your skin — including your scalp and hair follicles — is getting the nutrients and oxygen it needs. Without these, it can't continue to grow healthy hair, which eventually leads to thinning hair and baldness. Your skin actually makes nitric oxide within the dermis, your second layer of skin. As your cells produce nitric oxide, the newly produced nitric oxide begins to regulate the activity of your hair follicles. Since nitric oxide is a signaling molecule, it helps the follicles know that they need to grow hair. Your body produces nitric oxide on its own. But as you age, the levels it produces drop significantly. And that may be what contributes to the loss of healthy hair as you grow older. Fortunately, you can supplement what your body produces naturally. Adding a nitric oxide supplement, such as CircO2, to your routine will definitely help improve your circulation. And while no large clinical studies have been done to prove that supplemental nitric oxide can definitely reduce hair thinning as you age, many people have reported positive results. So don't let your hair detract from your youthful appearance. Make sure you are giving it what it needs to be able to continue growing thick, strong, healthy hair that may not reflect your age but definitely reflects how you feel. 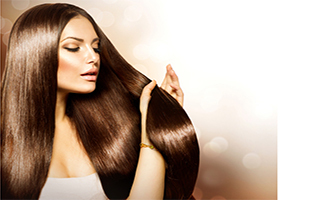 One final note: You may be taking hair nutrients such as biotin, omega 3 oils, zinc, vitamin D, etc. and your hair still is not where you want it to be. Sometimes simply adding the additional nitric oxide for a couple of months gets things jump-started because the additional nitric oxide enhances the utilization and absorption of your nutrients.